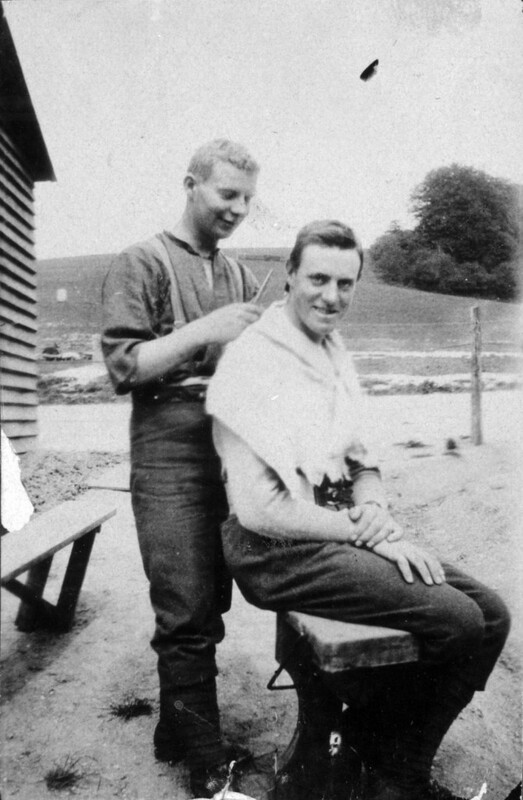 Melve King (seated) getting a trim from Rob Wakelin at Codford Camp, england, in 1917. Melville King was the son of Daniel and Mary King of Carterton. He was born in 1897, went to Carterton School and began work as a clerk for Maunsell and Hart, solicitors in Carterton. Melve was the right age to become part of New Zealand’s defence force set up after the Defence Act of 1909. He became a senior cadet, then a Territorial soldier, part of the 17th (Ruahine) Regiment. Melve and his friend Ron Wakelin enlisted in 1916, adding a year to their age to become part of the 20th Reinforcement. Melve’s service number was 30610. They trained at Trentham and Featherston before embarking on the Port Lyttelton on 7 December 1916. After the voyage which went via Capetown and the Atlantic Ocean, he entered Sling Camp on the Salisbury Plain for further training, part of the 3rd Battalion, Wellington Infantry Regiment. Melve arrived at the Western Front just before the Battle of Messines in June 1917. As a new boy, he mainly carried out labouring tasks such as carrying water and rations. He became a stretcher-bearer and worked at this during the Battle of Passchendaele when the New Zealand Division was badly hit. During leave in Britain Melve had his tonsils removed and recovered at the New Zealand hospital at Walton-on-Thames. Back in the N.Z. Division, Melve retrained as a scout/sniper and took part in the Somme battles of 1918 near Albert. Shortly after the New Zealanders captured Bapaume, Melve reported sick with clinical dysentery and this ended his active war. He spent months in hospital and the war had ended by the time he recovered. Melve arrived back in New Zealand in February 1919 and began working at his father’s woodworking company in Carterton. In 1923 he married Elizabeth Laurensen and the couple had two sons. Before the war Melve had been a volunteer fireman and he rejoined the Carterton Fire Brigade, becoming the secretary in the 1930s. In August 1938 Melve contracted pneumonia and died at the age of 41. He is buried at Clareville Cemetery. Melve began a daily diary on the day he sailed from Wellington and wrote until his hospitalisation in August 1918. He also took many photographs. In 2008, Wairarapa Archive published the diary as Things have been pretty lively : the Great War diary of Melve King. It gives a clear view of an infantryman’s life on the Western Front.